The June 3—16th tour is SOLD OUT! However, due to an overwhelming amount of interest in this tour, I’ve decided to run a “back to back” tour. When my guides and I drop off the folks that are heading home in group #1 at the Campo Grande airport for their trip back to Sao Paulo and then onto Miami, I’ll pick up group #2. All bookings for my lodges and guides are made, and I’m now officially opening up reservations and taking deposits for the new tour which will run from June 17 thru June 30th. 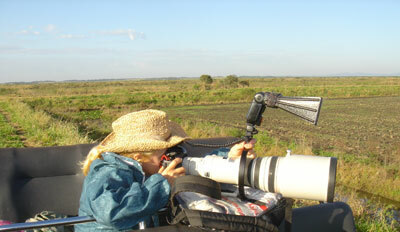 For those of you who haven’t read my newsletters expounding on the incredible photo and/or viewing “opps” this part of the world has to offer, or visited my website’s Pantanal gallery and seen the many wonderful images I was able to make, you really should take the time………..
Go to: www.joannewilliamsphoto.com. 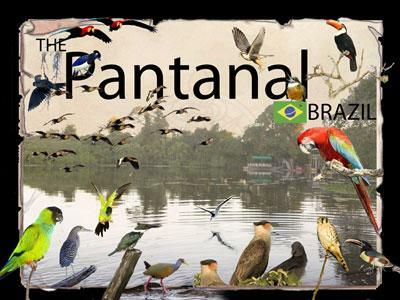 A few facts: The Pantanal is the largest in-land wetland in the world. 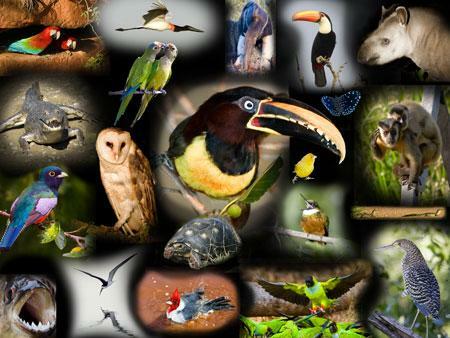 It is an unparalleled wildlife sanctuary of spectacular beauty, and an ecological paradise. The biodiversity of the region is extremely rich with 260 species of fish, and 650 species of birds calling this area home, including the endangered & rare hyacinth macaw. It has been brought to my attention via AGPIX, one of my Stock Agencies, that someone named Marlena Gee has been offering images obtained from photo sites, including AGPix, for sale as her own work. Using the web site: www.thecritterconnection.com, she has built a large library of what appears to be stolen images that she modifies digitally and then markets as her own. From what we have been able to ascertain, these images were being sold on products such as cards, mugs, etc. on Critter Connection storefronts hosted by Cafepress.com and Yahoo. She has also been known to use eBay to market her products. AGPix, along with several other photographers/agencies, has contacted the hosting companies and informed them of the situation; we are informed that www.thecriterconnection.com has been shut down by its host (Yahoo) and her operation has been removed from Cafepress.com. Marlena Gee, however, has a history of coming back. If you would like to monitor possible copyright violations involving your images you can keep an eye on www.cafepress.com and report any copyright infringement to Candice Carr. www.cafepress.com/cp/info/help/iprights.aspx is Cafepress.com’s page about their Intellectual Property Rights Policy. Violations found on Yahoo can be reported to http://docs.yahoo.com/info/copyright/copyright.html. From time to time, you might also want to monitor www.thecritterconnection.com or her back up site, www.doveangusfarm.com/images/ in case she hosts her site elsewhere. 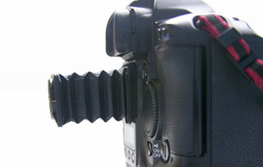 Rest assured that from both a technical and legal standpoint AGPix and I will continue to work against such situations. You, my readers, Please feel free to forward this newsletter on to any of your friends or fellow photographers, web-browsers etc. Perhaps if enough of us are aware of this “photo pirating” we can stop Marlena Gee, and people like her. I know I work too damn hard at my profession to have my work stolen…at least not without a fight. Watch Out, Marlena Gee, my friends & I are on the warpath and we’ll get you!! On a much happier note, and because “good conquers evil” and mainly because we seldom get the ‘pat on the backs’ we deserve, I’m sharing this…Recently two of my ‘tour-guests/clients, and/or students’… but mostly I call them my friends achieved a moment of much deserved notoriety for their wonderful work in photography. First (and NOT in the order of importance, nor having a thing to do with age! ), I’m so pleased & proud to share that Marilyn Gaizband’s wonderful image of a pair of Little Bee-eaters with dragonfly was published in the October issue of Birder’s World Magazine’s Gallery section. Marilyn, and her husband Sam, were on my 2005 African Safari when she captured this image in Samburu, Kenya. Congratulations and keep up the good work, MarMar! Birder’s World Magazine is a wonderful issue for those of us who love birds, photograph birds, and want to learn more about birds. 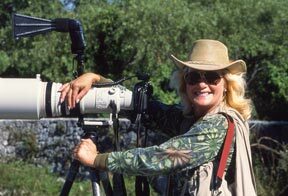 A quick history…back in 2004 I received a note from Steve Freligh, publisher & editor-in-chief of Nature’s Best Magazine that I was receiving ‘highly honored in wildlife’ in their 2004 annual Nature’s Best International Photography Awards issue! 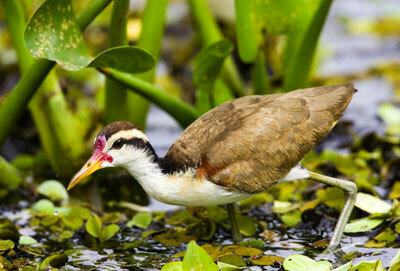 Not only that, but there was to be a banquet with all the other honorees (including the talented and very well known Art Wolfe), as well as a reception at the Smithsonian Museum of Natural History where my photograph, Least Bittern & Chicks, would be On Exhibit for a few months!!! Wow!! I can still feel the overwhelming awe of it all….to actually walk into that infamous museum and to actually see my work On Exhibit….hanging on the wall!! I still get goosebumps! A few months ago the phone rang, and a quiet little voice at the other end said “hi, it’s me”….. “I just heard from Steve Freligh that ……” “WOW! !” I interrupted…. “You’re in the running, Kiddo….Steve doesn’t just call, you ARE THERE! !” WHOOPPPEEEEE!!!! To make a long story short, ( hundreds and hundreds of hours of hard work and great photography later), I’m so proud to announce that friend, Laura Williams (no relation), is the Winner in the Animal Antics section of Nature’s Best 2006 photography contest. There were 12,000 images submitted from 28 countries, so this is no small achievement. In my opinion, Nature’s Best Magazine, is one of the most outstanding nature/photography magazines on the market. You’ll see outstanding images from all over the world, from the depths of many oceans, to the highest mountain tops climbable, and everywhere in between. My hat is off to Steve and all his staff at Natures’ Best…..another job outstandingly done!! was one of the winners for the Shell Wildlife Photographer of the Year award, which is owned by the Natural History Museum and the BBC Wildlife Magazine and is sponsored by Shell and supported by Microsoft. 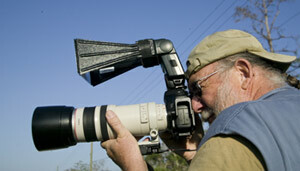 photographing the fabulous wildlife and scenics that the cloud forests and rain forests have to offer. While there last year, I was lucky enough to capture a fabulous image of a pair of Velvet-purple coronets in an unusual pose (Newsletter #37 & part of the Ecuador Gallery), which I call “angel wings”. I’m pleased and proud to be able to mention that this image is going to be included in the prestigious & award-winning engagement calendar, Inner Reflections. Inner Reflections has won 47 gold medals in national and international calendar competitions. I can only hope that those of my group and I will have as much success in finding great photo opportunities this year! “KEEP YOUR APERTURE YOUR PRIORITY”!!!!! !